I’ve written in earlier blogs about my love for prepping and planning ahead. I honestly believe that planing ahead is the KEY to having success with clean living! One of the things I have been doing lately is buying chicken breast in bulk or in the “family” packs that the grocery stores sell. At the beginning of the week I cook all 8 or 10 chicken breast, even though at that point I have no idea what I will do with them yet. I throw the whole pack in the crock pot! Once they are cooked, I keep a few in the fridge and then put the rest in the freezer. It makes it so easy during the week when I want to add chicken to a salad, soup or snack. The other day my friend Corrie came over during lunch and said she could whip up a healthy meal for us. I was excited because everything I’ve ever tasted from her has been delicious! She is the friend who was eating “clean” before it was cool! Back then we all thought she was nuts, but now some of my favourite clean recipes are from her! (check out the guacamole recipe in the “recipe” section! It’s hers and it’s divine!) As she was rummaging through my very bare cupboards and fridge (it was one of those “I really need groceries” days) she found some of my pre-cooked chicken, broccoli and some rice pasta and this is the dish she came up with!!! It was SOOOOO good! She didn’t write out the exact recipe, but I watched her make it and re-created it the next day….and the next..and actually the next too.. 🙂 SO this is my version of her masterpiece. For those of you who are pasta lovers, this is a great way to enjoy your pasta but in a whole new way! Enjoy! Pour olive oil into a pan on medium heat. Add in diced onions and broccoli. Cook until the onions are soft and then add in diced chicken pieces. 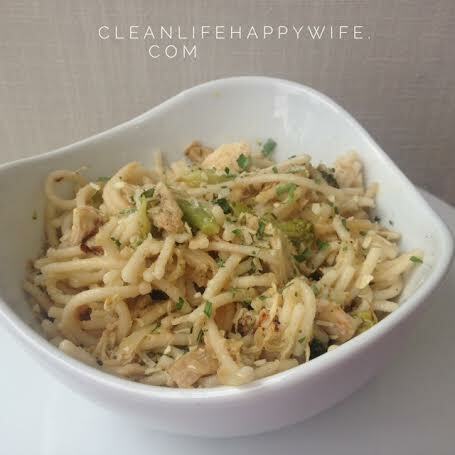 Add cooked rice pasta to the vegetable and chicken mixture and stir well. Add in the feta and salt and pepper to taste. That’s it!!! Super easy and fast and SO YUMMY!!!!!!!! This looks so good. But I am not a fan of goat cheese…any recommendations for a substitute?